Recently a friend asked me what Applications I use for Social Media which is a perfect blog post and one I have intended on doing for a long time, some of the images are actually older as I did intend on doing this a long time ago but the same information still applies. First and foremost, one of my favorite social media apps is one called SocialScope. It allows me to see all my social media sites on my Blackberry. In the picture to the right you will see the @ for any replies on all applications you use. In my case, the applications I use with Social Scope is Twitter, Facebook, Flickr, and Foursquare. The application allows to be post messages across all outlets as well as see any replies to my messages. Social scope also combines all direct or private messages sent to myself through the social media applications under the mail tab. 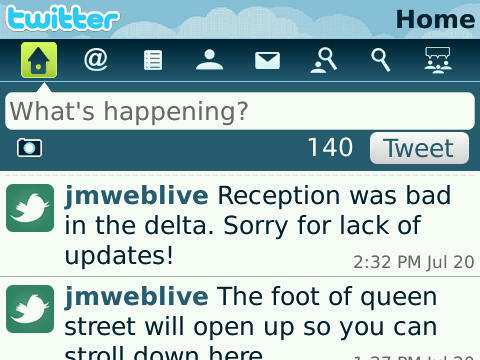 For those who follow my @jmweblive account, you will notice I use the Blackberry Twitter app. It is as good as social scope however it is only dedicated to the one single social media website, Twitter. It provides me with all the same access as SocialScope but is obviously just targeted to Twitter. Before I was using SocialScope, I used the official Blackberry Twitter app. At first, I had some problems on my old Blackberry Curve 8330 but since purchasing a Blackberry Bold, I have noticed a huge difference. 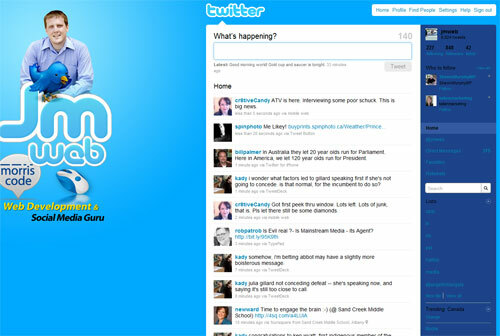 While surfing Twitter and checkout out the messages on my computer, I use the Twitter website. A lot of people use other applications such as Hootsuite but I like the simplicity of the Twitter website and prefer going to the source instead of going to another application. I guess it's almost like seeing it live vs seeing it through a secondary vision. 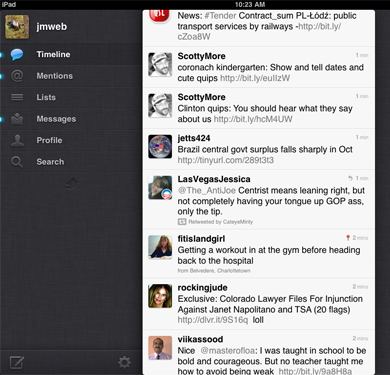 Before Twitter released it's new look and feel a couple months back, they released a Twitter iPad Application. The application, built specifically for iPad's, was an example of what was to come for the new Twitter site. As with all the other applications I use, it allows me to check my replies, messages and public tweets. It also allows me to use my lists, which are extremely important. The application also has an iPhone version. TwitterFeed is an excellent tool when you have an RSS feed and wish to post updates to your Twitter when the RSS Feed is updated. Contrary to its name, TwitterFeed also allows you to integrate your Facebook and Twitter and any RSS feeds you have. Previously, I used to use Hootsuite for this however I changed to Twitterfeed when they offered a option to update your Twitter feed or Facebook feed once every 15 minutes. At the time, the standard was once every 30 minutes. Twitterfeed has since removed the once every 15 minutes option and went back to once every 30. I use it for things like the unofficial @theguardianpei Twitter account, which was setup long before The Guardian ever had Twitter. Lastly, the odd time you will see me using TweetDeck. When the tweets are faced paced for something like a Twitter Chat session, I will use Tweetdeck to keep up to date quicker. As these sessions usually happen at a faster pace, it is important to obviously be able to keep up. Tweetdeck allows you to see your public messages, your replies, your direct messages as well as any hastags (which is what the chats are under) that you have setup. 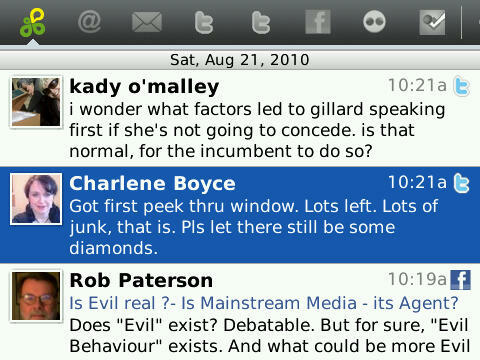 I should also mention that Blackberry has built a new application in version 6 of their OS called Social Feeds. I have not used it extensively but from what I have seen it looks almost as good as SocialScope.